I usually don’t post about Game of Thrones while the show is currently airing. I try to save all my opinions and observations for the off-season when I need to write about the show as a therapeutic exercise, but rules are made to be broken. Broken, like chains or wheels are to Daenerys Targaryen. Mace Tyrell: Rule breaking? That’s Madness! Madness! A few years ago, I wrote an article about the different looks of the various military factions in Game of Thrones, a sort of guideline to aid in identifying the groups of armed men that a viewer might be presented with on the show. The key is the distinctive helmets that each group uses. For the most part, that’s all that’s required to tell your Stark from a Stormlander, an Ironborn from a Bolton. There were a few groups that I omitted in that post. The knights of the Vale just didn’t seem to have anything that jumped out at me as notable, armor-wise. And I was bummed out when we visited Renly’s camp of mixed Stormland/Reach forces in season 2. Very generic-looking men-at-arms. 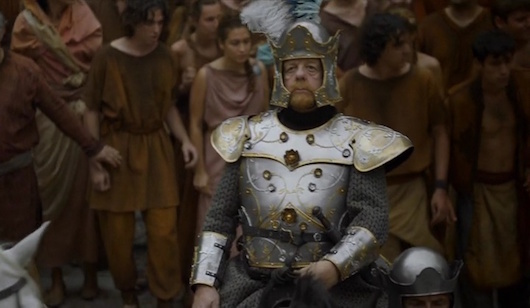 I was hoping for some helmets or armor (but really, helmets) that communicated an “I’m from Highgarden!!! Team Tyrell!! !” type of message. But there really wasn’t that much in evidence. 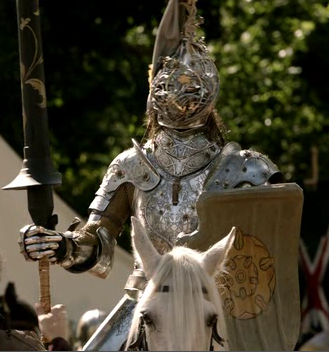 Apparently all the design work along those lines had gone into Ser Loras Tyrell’s super-flowery tournament armor from Season One. Loras is winning! If not best knight, then best dressed. So I was delighted that in the last episode (Season 6, Episode 6, Blood of my Blood) when Mace Tyrell, the Lord of Highgarden, led a host of Tyrell troops into King’s Landing. The Tyrell accoutrements did not disappoint. But let me step back a moment. 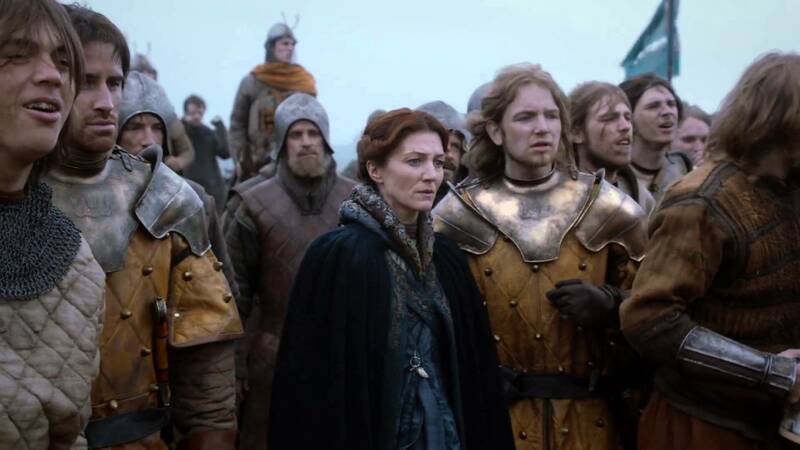 I shouldn’t overlook that we did see some Tyrell men-at-arms escorting Lady Olenna last season, when the Queen of Thorns came to try and negotiate with the High Sparrow. They kind of looked distinctive, I guess. 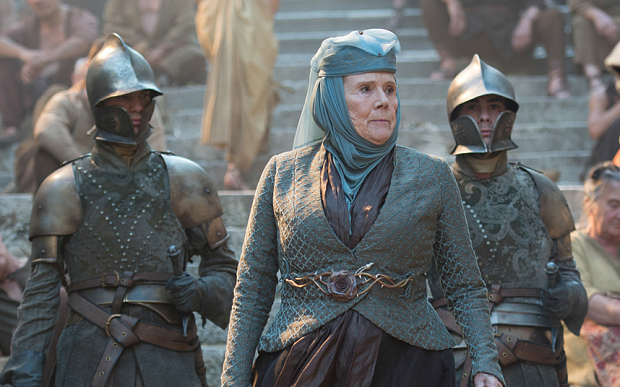 Lady Olenna: They all look alike to me. Foolish. With their stupid faces. 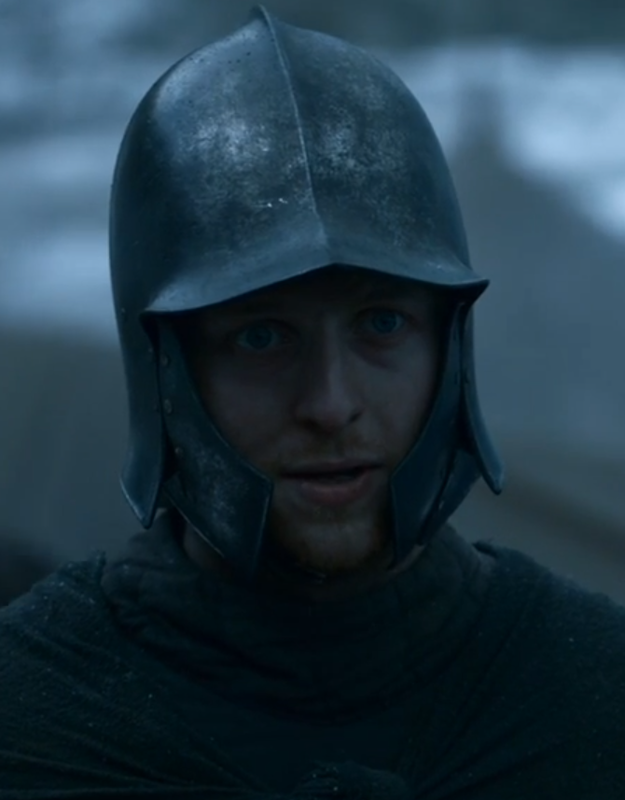 Their helmets were similar to the Baratheon Stormlander helmets, with the addition of some serious face-obscuring cheekguards. But I was kind of disappointed. This season a Tyrell army marched into the city, to the Sept of Baelor. They were not generic-looking, or near-duplicates of their neighbors from the Stormlands. The sigil of House Tyrell is a rose (a rose which is Growing Strong) and the new helmets suggest the petals of a rose around the crown of the helm. This makes it much easier to identify a Tyrell soldier. Particularly in King’s Landing with various members of House Lannister, the city watch Goldcloaks, and members of the Kingsguard about. On the right, a Tyrell guard. On the left, a monstrously-huge possibly undead killing machine. It’s best not to confuse those two. But I think it’s relevant that the show’s art department for this season designed a thematic look for the Highgarden troops. 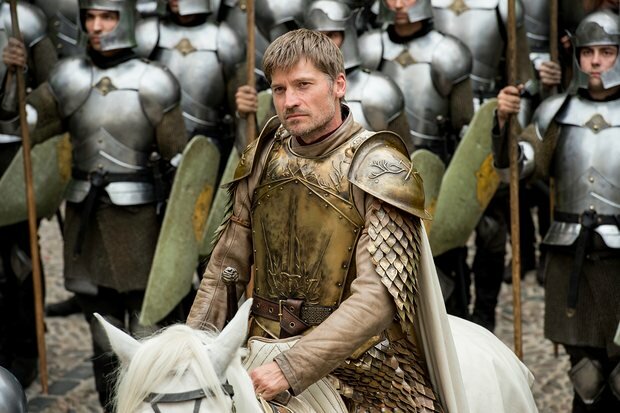 Ser Jaime: Where the hell is MY helmet? 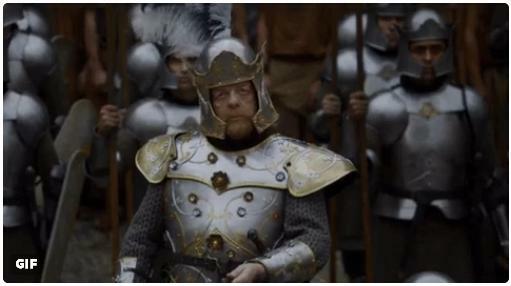 CGI was no doubt employed to fill out the ranks of the Tyrell army for the longshots, but certainly many pieces of armor (and those rose-crested helmets) were manufactured for the brief showdown between Jaime and the High Sparrow. For the show’s production to justify doing that, it’s likely that we’ll see some near-future action with Tyrell fighting men. A lot of Tyrell fighting men. There are plenty of candidates for Tyrell soldiers to either fight against or possibly alongside. 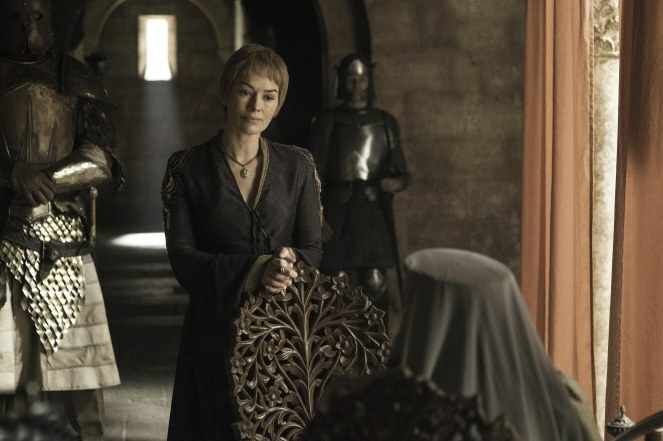 There’s been a brewing Lannister-Tyrell conflict thanks to Cersei (which might even include participation from the Knights of the Vale, if Baelish decides to not invest anymore in the North.) The Dornish have become a dangerously unpredictable wildcard, and who knows how fast war-mongering Euron Greyjoy can build his fleet of ships? Regardless of who is killing who, if the flowery chivalry of the Reach are involved, we’ll be able to identify their soldiers on sight. Finally. Thanks for breaking your rule and writing this article. As always I appreciate your observations and close attention to detail. I agree that in the battles to come (surely soon) being able to spot the differences between the soldiers is going to be very helpful in working out which alliances have been made (there are still some unknowns there as you pointed out). I have always wondered, in close battle, how do the soldiers know which persons to bash in and stab and which ones they should be helping? I am certain that battle situations are very confusing .. it would be easy to get into “stabby mode” and accidentally stab your own guys in your wild enthusiasm (and absolute terror). I don’t think an apology would suffice.. Differences in helmet design could save lives! Make more helmets! and absolutely.. “just give the knights of the Vale some kind of falcon-embellishment on their helmets” that would be fantastic! I’m sure actual battles, once everyone got their tabards covered in mud, were full of friendly-fire type of problems. Things were easier in Lord of the Rings. Aragorn: Okay, let’s go kill some orcs. Joe: But don’t kill me! I just happen to be ugly. Aragorn: this might be a problem. You do kind of look like an orc. Joe: can’t you all look for my inner beauty? Ooh, I get to be all teacher-like and educational with this comment…! Did you know that the leek is the national emblem of Wales for this very reason? Well, so the story goes anyway – apparently St. David (the patron saint) told his soldiers who were fighting the Saxons to pop a leek on their helmets so that they wouldn’t be accidentally killed by their own men! That is amazing! Thank you for the leek detail. You’re classing up the place with your great book-learning! I’m sure they don’t mind. You are right about Drogon having all the fun at the moment. “and now a pre-adaptation of the unpublished future books.” intentional wry commentary on the predicament GRRM has gotten himself into? How will he ever keep straight in his head the little twists, MIA characters and substitutions he’s overseen in the show? He’s going to have to exercise super-genius concentration to do so. I’m hoping he bears down & gets that next book out, stat! Yeah, I don’t know if I was being too clever. While I was wordsmithing the first line, it struck me that the show has to be viewed as something other than strictly an adaptation. And I totally agree, The Winds of Winter can’t come out fast enough. Back on the topic of the next book, GRRM got the con crud when he visited Balticon, so he needs to rest up a bit. Ugh! FYI, I just loved this week’s episode of GOT. Women of power unite! Sansa is showing some tremendous strength (and acting skills) and I liked the way she gruesomely finished off the evil Ramsay. Glad you loved the episode, I did too. I was not unhappy to see Ramsay get his face eaten by his weaponized dogs. Thank you for dropping by and leaving me an episode comment, always great hearing from you! Ah Ser Patrick. I, too, was wondering if my alter ego, Khaleesi, had being pondering sexual fluidity. Yara is appealing in a salty, butch way… 😉 I think last night was my favorite episode ever! The battle was very dramatic! Poor Wun Wun and Rickon. But now Sansa has to keep Baelish from taking over, the slimy slug. I think Sansa might have learned something from the loathsome Ramsay which will keep Petyr in line, we can hope. 🙂 I do like the actor. You can have mixed feelings, Khaleesi. We’ll make sure he doesn’t mesmerize you. Thank you for a good look at some of their armour , not very often that it is brought up and when it’s on tv if you blink you miss it most of the time. I don’t know if the DVD extras have any details about them. I have the package of seasons 1-3 and have just ordered seasons 4 & 5 so maybe there might be something on them. But , as always, I like your explanation of GoT things. Look forward to your writing about things from season 6 while it is still fresh in my head, lol. My wife wants to rewatch the entire show so far soon which I am happy about as I forget so much, lmao. Your wife is pretty smart, wanting to re-watch. Thumbs up! I’m glad you like my discussion on the armor. The show does a good job representing the different factions with fashion. Hey, a Tyrell post! The Tyrell’s armor this season was quite impressive, whereas I wouldn’t have been able to even recall what their design was in previous seasons. I never put together that the crests on the helmets were designed like flower petals. Good eye for detail! The Tyrells are the only people who can make flowers look awesome. Thanks! I’m just glad the show put the Tyrells in some distinctive armor. It made my earlier work on Stark, Greyjoy, Lannister, Baratheon helmets (among other bits) a tad more comprehensive.